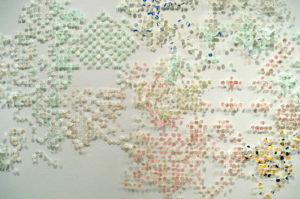 Associate Professor Denise Bookwalter has recently exhibited in several locations across the country. The exhibition Southern Exposure: Academic Book Arts in the New Millennium, brings her works using Book Arts to the University of North Carolina Chapel Hill and also to UNC Charlotte. 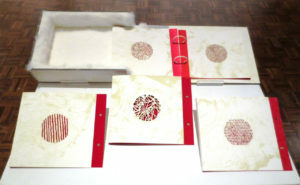 Another Book Arts exhibition, Cut/Create: The Endless Possibilities of Paper is on display in Wisconsin. Suzanne Sawyer serves as guest curator for the exhibit. Artists are Denise Bookwalter, Kerri Cushman, Doug Baulos, Lee Running, and Lauren Faulkenberry. The exhibit will be on view through Nov. 20. For more information, visit Robert C. Williams Museum of Papermaking online or to arrange group tours, contact Virginia Howell at 404.894.5726 or virginia.howell@rbi.gatech.edu. Free and convenient parking is available at the museum. The exhibition presents a broad range of work where paper is the primary medium of expression. The show includes the work of seven regional artists, including Heather Beardsley, Dara Larson, Dutes Miller & Stan Shellabarger, Matthew Shlian, Michael Velliquette, and Nathan Vernau. UWM Special Collections is a co-sponsor, and the exhibition also includes fourteen book-works from our collection by artists such as Kurt Allerslev, Marshall Weber, & Chistopher Wilde; Denise Bookwalter & Lee Emma Running; Nathan Beyer; Sarah Bryant; Kelie Bowman; Macy Chadwick & Carrie Ann Plank; Stephanie Copoulos-Selle; Lois Morrison; and Claire Van Vliet. Co-sponsored by the College Book Art Association, artist’s book works submitted to this exhibition were created by faculty, staff, and students of academic institutions in Alabama, Arkansas, Florida, Georgia, Kentucky, Louisiana, Mississippi, North Carolina, South Carolina, Tennessee, Virginia, and West Virginia. A contemporary survey, the juried works demonstrate the breadth and depth of work being produced in programs across the South. Southern Exposure has been co-organized by Lisa Beth Robinson, Assistant Professor at East Carolina University’s School of Art and Design, who is a member of the Exhibitions Committee at CBAA. This show will travel to the University of North Carolina-Charlotte in March 2016.